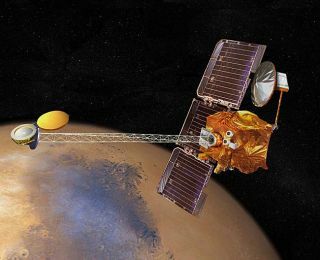 The Mars Odyssey orbiter's computer system was rebooted yesterday to clear memory flaws accumulated in more than five years since the last reboot. The procedure also restored Odyssey's onboard set of backup systems, called the spacecraft's "B side," allowing its use in the future when necessary, according to a NASA statement. "For nearly two years, we have not known for certain whether the backup systems would be usable, so this successful reboot has allowed us to ascertain their health and availability for future use," said Odyssey Project Manager Philip Varghese of NASA's Jet Propulsion Laboratory, Pasadena, Calif.
NASA had said last week the reboot was needed. Odyssey has been orbiting Mars since 2001 and has never switched from its primary set of components, the "A side," to the backup set, which includes an identical computer processor, navigation sensors, relay radio and other components. In March 2006, the B-side spare of a component for managing the distribution of power became inoperable. Analysis by engineers identified a possibility that rebooting Odyssey might restore that component, which proved to be a side benefit of yesterday's procedure to refresh onboard memory. The Odyssey team began a series of steps after the reboot to carefully return the spacecraft to full functioning over the next few days, the statement said. Science instruments will be back to studying Mars by next week, mission planners expect. An unexpected rise in temperature of the star camera in Odyssey's navigation system on March 9 had prompted a postponement of the rebooting originally scheduled for the next day. Engineers identified the cause as a heater circuit that was temporarily stuck "on." The circuit was turned off before yesterday's reboot.